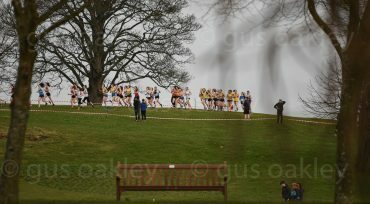 Saturday 11th October saw the first cross country race of the season in the form of the West District Relays which were switched from the original venue at Port Glasgow to Birkmyre Park, Kilmacolm as the original venue was considered to be too dangerous for athletes owing to excessive rutting. Team manager Alan Sprang had been hopeful of fielding numerous teams in both the boys and girls races but some very late call offs in the girls meant a fair bit of last minute shuffling of the pack. Owing to Birkmyre Park being fairly small the course was quite compact and there were several loops of the park required to make the distance. Conditions on the day were good for running with no wind and the early light rain giving way to much brighter conditions. First off was the Young females race which consisted of teams of 3 athletes with the first being u13 followed by either an u13 or u15 then either an u15 or u17. Owing to the late call offs Seaforth were only able to field 3 complete teams and an incomplete team of 2 runners. Emma Frew who was the first runner for the ‘A’ team came home in 1st place over the 2500m course in a time of 8:55 handing over to India Birrell who was up against some very stiff competition but held on for 8th position at the changeover having covered the course in 10:12, the anchor leg was down to Kirstin Oakley who showed that all miles covered in training are paying off by covering the distance in 8:43 to come home in 3rd place for the bronze medal behind Giffnock North ‘A’ in 1st place and Kilbarchan AAC ‘A’ in 2nd . In the Young Males race Seaforth fielded 4 complete teams with the Seaforth ‘A’ team going one better than the girls coming home in an excellent silver medal 2nd place. The lead runner was Scott Sprang who covered the course in a time of 8:39 handing over in 1st place to Lewis Ross who showed some fine form completing the course in 8:27 holding on to 2nd place before handing over to the anchor runner Fraser Stirling who brought the team home with a lap time of 7:46 for the silver medal. Although there were no Senior Female teams Seaforth did field 2 Senior Male teams some of whom were running their first cross country race for the club with Seaforth coach Alasdair Meldrum stepping up to the breach at the last minute after call offs. This document aims to ensure the selection process is clear and transparent to all athletes and coaches. The selection team comprises John Rodger and Anne-Marie Hughes, with Clare Barr acting as adjudicator in case of selection disagreements. Inter-Districts (early January at Holyrood Park, Edinburgh). U13/15/17 and Senior teams compete against Scottish East and North Districts. The BUPA/NOVA-sponsored meeting also includes a 4k race and an international race for senior and U20 athletes. These races can impact the West District team as eligible athletes may be selected to compete for GB or Scotland or a University team, or may elect to run the short course race instead. 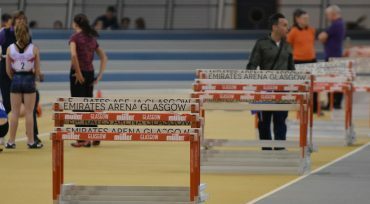 Inter-Counties (late February or early March, Birmingham). U15/17/20 and Senior teams compete against County/District teams from across the United Kingdom. Results from the following races are the primary source of information used in selection decisions. They are collated onto a spreadsheet so they can be examined objectively. If there is difficulty in making a decision, the selectors look at other races for head-to-head comparisons, along with Power of Ten information and current form. There are 15 places available in each of the U13, U15, U17 and senior teams. The first 12 finishers in the West District CC Championships are automatically selected, with the additional three at the sole discretion of the selectors. These discretionary places allow consideration of athletes who may have had an unexpectedly poor race at the West District CC Championships (or were unavailable to compete) due to illness, injury or other commitments. Clubs, coaches and athletes are actively encouraged to keep the selectors informed of any extenuating circumstances regarding the performance of athletes. The U20s and seniors compete in separate races of different distances at the West District Championships, so head-to-head comparisons between these age groups are difficult. Therefore, the selectors must make a judgement as to which U20s should be selected for the senior team. This is further complicated by the fact that Scottish Universities have the first pick of eligible athletes to run for their teams rather than the West. Selection for this race is rather more involved. The Inter-Counties race is the final event of five in the British Athletics Cross Challenge series. Athletes who rank in the Series top 20 are automatically entered and it is expected that West district athletes who feature in the top 20 will be selected for the district team. Entries must be submitted very early (by the end of January); there are no late entries or substitutions allowed after the closing date. The selectors refer to results from previous races, including the Inter-Districts, to enter the maximum number of athletes allowed in each age group. To cover situations involving injuries, illness, etc, 12 athletes are entered in the initial list, although only a maximum of eight can be selected for the final team. (In the case of seniors, 15 are entered in the initial list, with a maximum of nine for the final team). IMPORTANT: an athlete being on the entry list (online misleadingly called the “Start List”) does not guarantee that they will be ultimately selected for a final team place. For final team selection, results from the National CC Championships are used, along with all other previous results. It should be noted that, for reasons of costs and logistics, total team places are limited to approximately 30-35, with preference given to age groups that have the best chance of medalling, so considerably fewer athletes are ultimately selected than appear on the initial entry list. 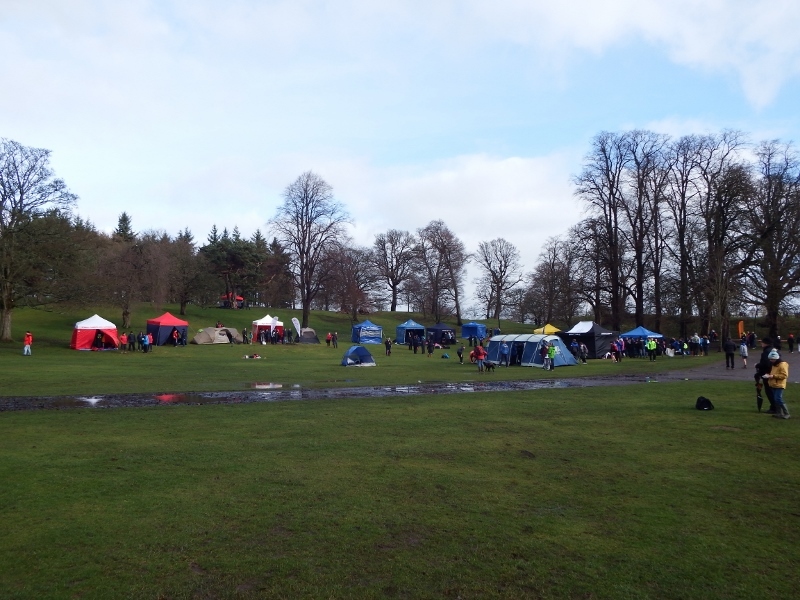 A further complication is that the Inter-Counties often clashes with the Scottish Schools Cross Country Championships, creating a tough choice for selected school-age athletes. This is not the case in 2015. If an athlete has been entered but not selected for a final team place, they are eligible to race if they choose to do so, but must make their own independent travel and accommodation arrangements. 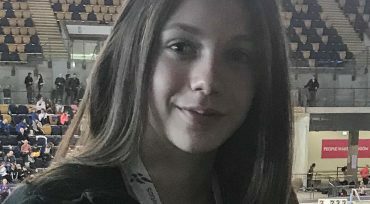 In addition, the West District does not select an U13 team for this event, therefore U13 athletes in the series top 20 who wish to compete must travel independently. Lastly, it’s worth mentioning that, on occasion, the Inter-Counties includes a Home Countries International. 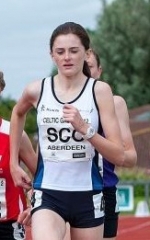 Athletes selected to run for Scotland can also be included in the West team i.e. they can score for both country and district. With the summer track season about to finish another cross country season lies just around the corner. Last season the club had excellent numbers participating in these events with many first timers at all age groups including athletes from the sprint squads who hadn’t tried such competition before…….some even liked it !!! There are all sorts of competitions available from the very low key local Ayrshire races right up to National Championships and it is hoped that we have a large turnout at many of the events again this season. A list of most cross country & road race events can be viewed by clicking here . 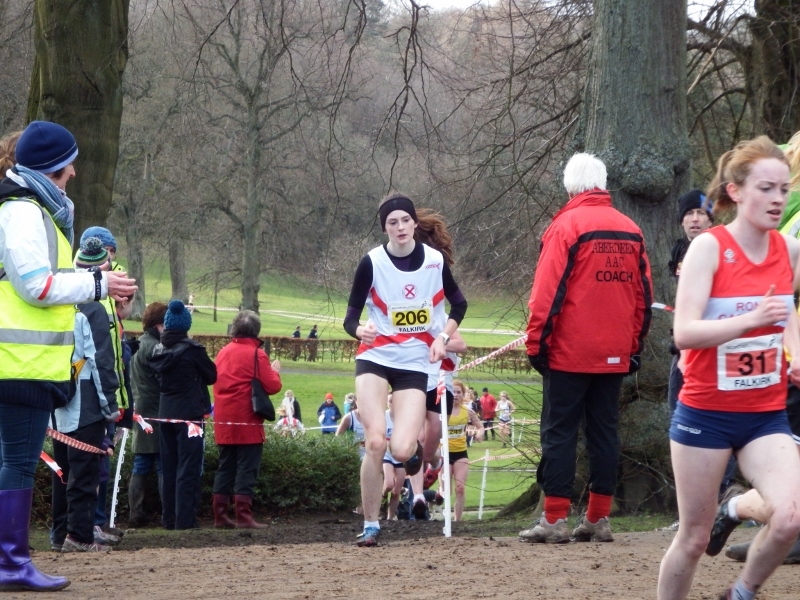 Saturday 22 February 2014 saw the Scottish National Cross Country Championships return once again to the excellent setting of Callendar Park, Falkirk which has been its home for the previous 8 championships. The recent heavy rains had made conditions on most of the course soft underfoot with several areas being very soft indeed. These energy sapping conditions along with the hills throughout the course ensured that this course was not for the faint hearted. There was however good weather on the day with the rain only returning in time for the start of the last race which was the Senior mens race. 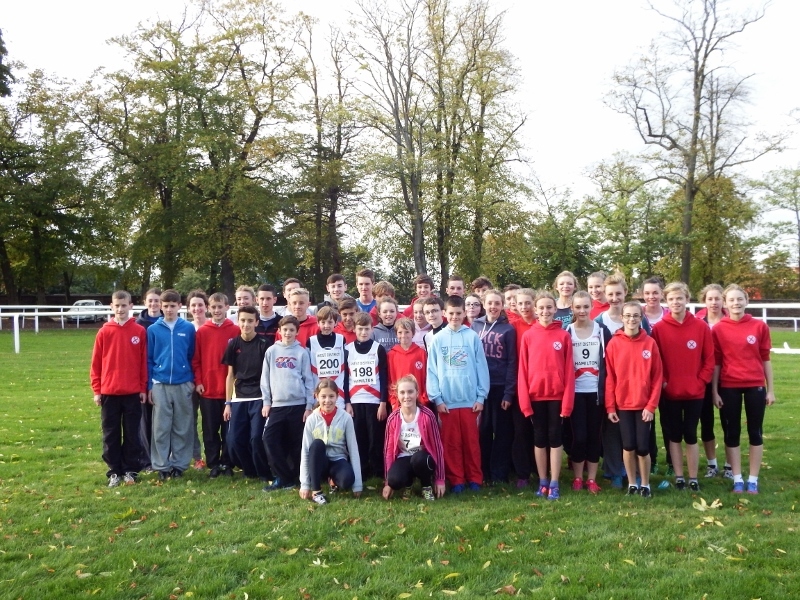 Ayr Seaforth have shown great strength of numbers in cross country races this season and the Nationals were no different with the club having 35 starters from the Junior section and 9 from the Senior section at Falkirk. This was typical of a lot of clubs as the total entries for the day topped 2100 runners which was the highest entry for 19 years. Caitlin Chilton 47th 15:58 ; Jena Anderson 88th 17:23 ; Alison King 102nd 17:58 ; Emma Palmer 105th 18:12 ; Erin McCutcheon 107th 18:19 ; Melissa Miller 111th 18:47 ; Eilidh Carswell 115th 19:03. Next was the turn of the u15 boys which is always a hotly contested 4000m race, of the 120 who completed the race Seaforth had 6 athletes. First home for Seaforth was Fraser Stirling in 11th place with a time of 14:18 followed by Lewis Ross 47th 15:16 ; Jamie Brotherston 51st 15:30 ; Ross Nicolson 58th 15:40 ; Rhys Sim 59th 15:45 ; Ewan McLevy 72nd 16:03. The 5 Seaforth u15 girls who ran in the next race also had to overcome the same 4000m course as the boys. The finishing positions and times for those athletes were India Birrell 66th 18:43 ; Jacqui Gibson 75th 19:38 ; Mia Cullis 76th 19:40 ; Megan Short 94th 21:41 ; Rebecca Martin 103rd 23:16. The only other Junior race where Seaforth had competitors was the u17 womens race and it produced the best result of the day. This race was run alongside the u20 womens race over a very challenging 4800m course and it was once again Kirstin Oakley who gained the credits finishing in an exceptional 2nd place in a time of 17:38 followed home by team mates Lisa Rennie 22nd 20:17 ; Beth MacRae 35th 21:43 ; Rachael King 36th 21:55 ; Amy Palmer 47th 28:02. The final race of the day was the Senior mens race which was over a 12000m course and had no less than a massive 566 runners finishing the race, Seaforth again were well represented with 9 athletes competing. The final positions and times were Craig McPike 208th 48:37 ; Stephen McCrorie(M40) 235th 49:19 ; Mark Caldwell(M40) 277th 50:29 ; Stuart McLean(M40) 334th 52:18 ; Laurence Baker(M55) 361st 53:07 ; James Murray 368th 53:17 ; Peter Laing(M50) 466th 57:46 ; Iain Pettigrew(M45) 508th 60:38 ; Ian Baird(M60) 524th 62:04. A group of 28 hardy Seaforth cross country runners took part in the new East Kilbride AC cross country races which were held at O’Cathian Farm, Jackton on Sunday 19 January. After the recent heavy rains the course for the event had turned in to what must have been the muddiest course seen in many years, there was also the long hills to contend with which made the course a real energy sapper. There were some good runs by Seaforth athletes with Fraser Stirling taking bronze in the boys u15 race,Emma Frew winning the silver medal in the girls u13 race and Scott Sprang going one better to take gold in the u13 boys race. In the boys u15 race the team prize went to Seaforth athletes Fraser Stirling, Jamie Brotherston and Lewis Ross and in the u15 girls race the team prize went to Seaforth athletes Mia Cullis, India Birrell and Megan Short. 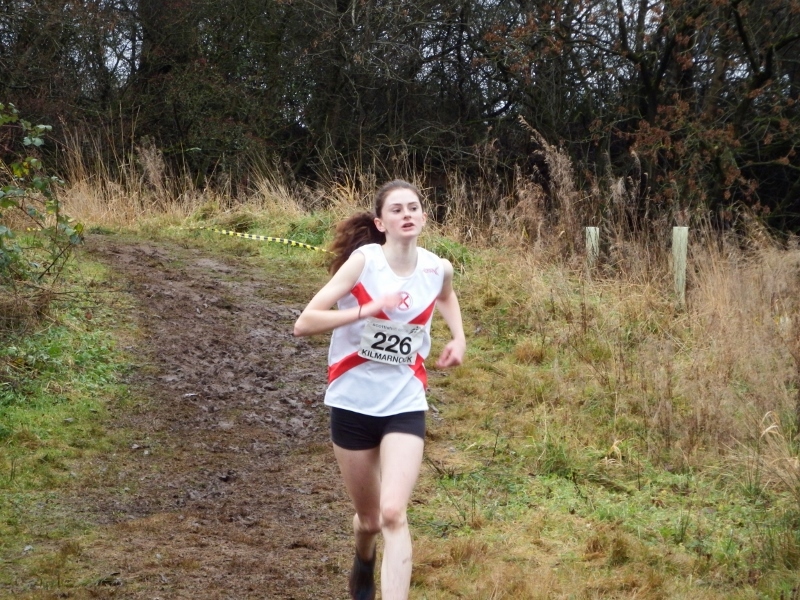 A special mention goes to Eilidh Carswell, with around 800m to go she lost a shoe in the thick gloopy mud but undeterred she simply picked it up and ran the rest of the course with it in her hand passing 2 other runners on the way in….well done Eilidh. After a cold and frosty start to the day blue skies and soft underfoot conditions greeted those Seaforth athletes who had been selected for Scotland West to compete at this years Inter District Cross Country Championships which took place in the magnificent surroundings of Holyrood Park, Edinburgh in the shadow of Arthurs Seat. These races were the prelude to some top class International races later in the day which saw some of the worlds top male and female distance runners competing. Teams from Scotland West, East and North compete these races with 15 athletes running for each area. First up was the u13 races which saw the boys and girls run a 3km distance with a 2 minute gap between the races starting. In the girls race Seaforth had a sole selection in Emma Frew who has shown herself to be a real prospect this season. She ran an excellent race tucking in behind 4 athletes from Scotland East for the first 2 laps of 3 on the short 1km course. She then made her move and with about 400m to go found herself in third place with the finish in sight, after a thrilling finish she came home in 2nd place only four seconds off of 1st place to claim the silver medal also leading her West team to the team silver. 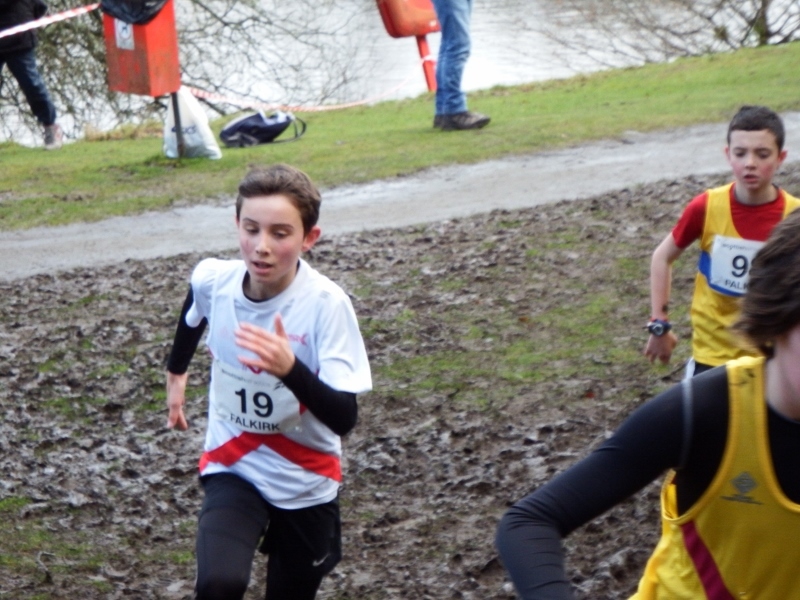 The boys u13 race saw Seaforth with two first time participants in the form of Scott Sprang and Daniel Martin. From the start young Scott pushed himself hard and was in the front of the pack just behind the leaders for the first two of the three laps with his efforts eventually gaining him a worthy 7th place finish and also a share of a team gold medal. Daniel found the going tough in the windy conditions but fought hard to come home in 32nd position. 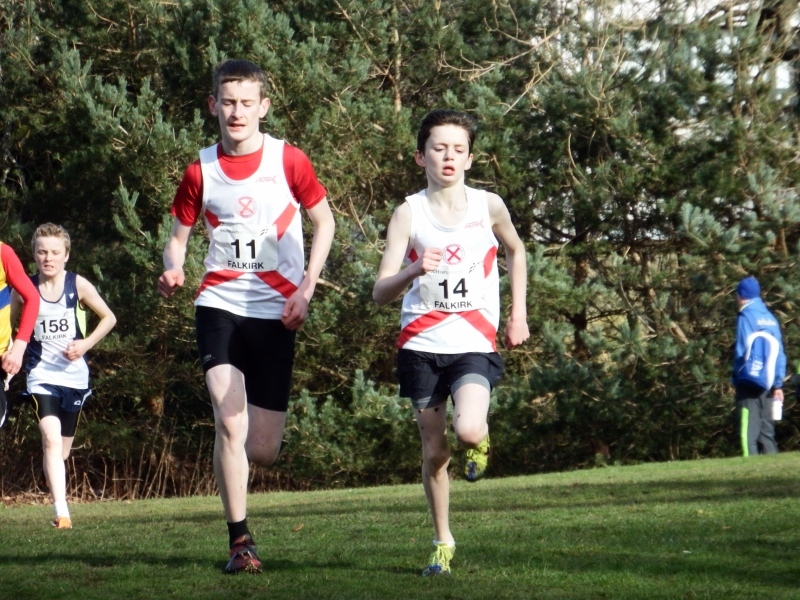 Next was the u15 races where Seaforth had a sole selection in Fraser Stirling. These races were over a longer 4km distance which saw Fraser fight hard to come home in 17th position as part of a group of 8 athletes separated by only 10 seconds. Following on after the senior & junior Inter District categories was the BUPA Great Edinburgh Junior International races which were run alongside the u17 Inter District races. The Junior races saw the best distance runners from Great Britain, Team Europe & the USA in the Junior category which comprises of athletes who are aged 17 but under age 20.The first race was the 6km male race where Seaforth had James Pettigrew gaining his first District selection. This was a fast paced race in which James gave his all to finish in 45th place overall and 27th in the Inter District race. The last race of the day with Seaforth interest was the 4km female u17 Inter District & Junior International race which saw Seaforth athlete Kirstin Oakley make her 5th appearance in the event with the race also featuring team mate Lisa Rennie. Kirstin made an excellent start to the race and tucked in behind the 2nd place athlete in the Inter District race and Team West colleague Catriona Graves of Garscube Harriers for almost the entire race.The race that ensued between them took them clear of the rest of the field and at the last turn with 200m to go Kirstin made her move and finished a deserved 4 seconds clear of Graves in 20th place overall and 2nd in the Inter District race. The race between them actually saw them close on the Junior International field with Kirstin only finishing a second behind USA athlete Allie Buchalski. To add to this both of them were rewarded with a team gold medal. Lisa ran a gutsy race taking her to a 25th place finish in the Inter District competition. To make her day Kirstin also managed to get a photograph taken with 3 time World and Olympic 1500m winner Asbel Kiprop of Kenya who ran in the BUPA mens 4km Invitational race. Ayr Seaforth middle distance runner Kirstin Oakley has been rewarded for her efforts as she has been selected for the Scottish team travelling to the Celtic Nations Cross Country Championships which take place at Greenmount Campus, Antrim, Northern Ireland on Saturday 4th January 2014.This follows on from her Scottish selection for this years British Junior Road Race Championships in London and last years selection for the u18 team at the Celtic Nations Track & Field Championships. A big well done from everyone at Ayr Seaforth. 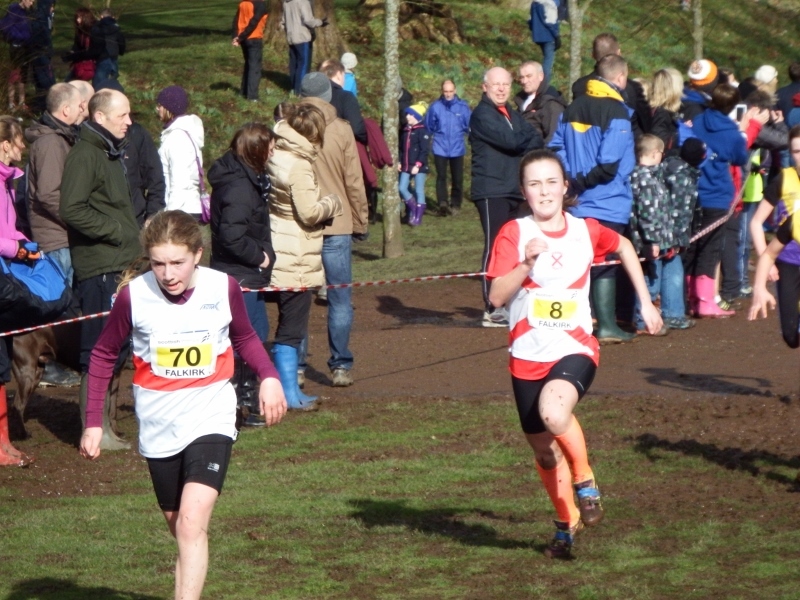 Ayr Seaforth were very well represented yet again this weekend when no less than 38 athletes took part in this years West District Cross Country Championships at Kilmarnock. 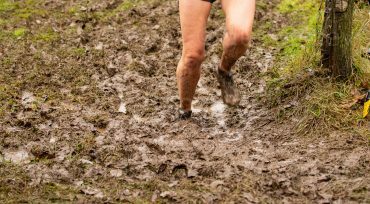 Owing to the recent wet conditions the flat course once again proved an excellent cross country test with very muddy conditions and part of the now infamous Killie Swamp being used which even managed to claim a shoe from u15 athlete Fraser Stirling that was never found. The first race of the day was the girls u13 race which was run over 3200m. There were 86 runners and Seaforth had 8 entrants. The final places were Emma Frew 2nd(11:23) ; Caitlin Chilton 26th (12:36) ; Lucy Davidson 28th (12:43) ; Emma Low 36th (13:04) ; Charlotte McDowall 40th (13:12) ; Lexie Smiley 56th (14:05) ; Eilidh Carswell 61st (14:16) ; Alison King 72nd (14:51). 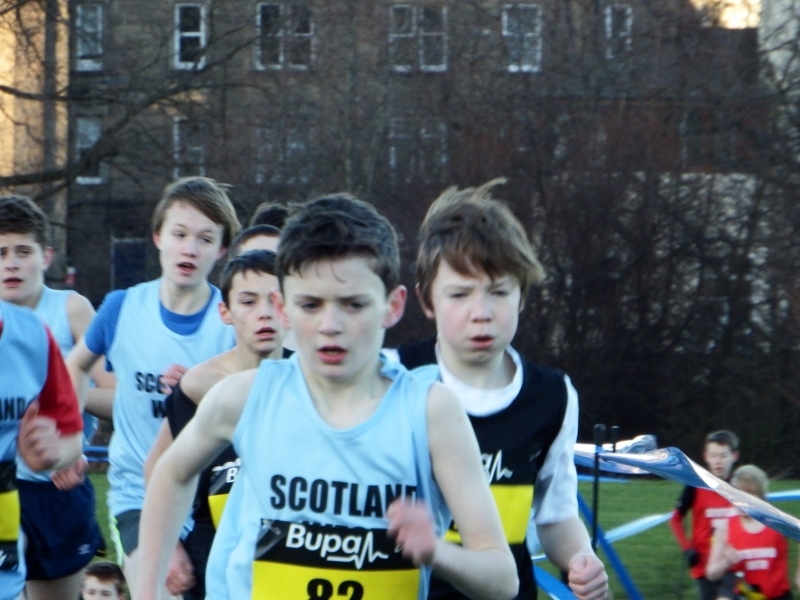 This was followed by the u13 boys race which had 9 Seaforth runners in a field of 64 over the 3200m course. Finishing places were Scott Sprang 3rd (10:25) ; Daniel Martin 15th (11:03) ; Declan McGhee 20th (11:13) ; Greig Oakley 29th (11:38) ; Logan Cotter 33rd (11:53) ; Steven Martin 49th (12:27) ; Joshua Cooke 52nd (12:38) ; Alasdair Armstrong 61st (13;59) ; Callum Laurie 64th (14:43). The u15 girls were next with 5 athletes from Seaforth in the 63 strong field over the 400m course. Those athletes positions were Mia Cullis 38th (15;56) ; India Birrell 40th (16:09) ; Megan Short 47th (17:02) ; Georgia Brawley 57th (18:23) ; Rebecca Watson 59th (18:35). The u15 boys race was also over the same 4000m course with Seaforth only having 2 athletes running in the 61 starters. Positions were Fraser Stirling 7th (12:24) and Ewan McLevy 41st (14;11). The u17 women were next running over a 5000m course with Seaforth having 3 athletes in a field of 34 runners, this race also having the u20 women running alongside the u17 women. Final positions were Kirstin Oakley 5th(18:18) ; Lisa Rennie 16th(20:33) and Rachael King 23rd(21:31). The u17 mens race was over 6400m and Seaforth had a single entrant in the field of 36 with James Pettigrew coming home in 9th(21:03). The final race of the day was the senior mens race which was over a distance of 10,000m. There were 10 Seaforth athletes in the field of 195 and their final positions also show their position in their respective age category…..Kenneth Neill 36th(40:29) Senior 29th ; Stephen McCrorie 72nd(43:18) M40 20th ; Alex Dunlop 83rd(44:00) M40 25th ; Stephen Kay 90th(44:22) Senior 49th ; James Murray 98th(45:00) Senior 53rd ; Chris Boyce 115th(46:39) Senior 60th ; Peter Laing 129th(48:06) M50 24th ; Laurence Baker 142nd(49:16) M50 28th ; Paul Turnbull 152nd(50:02) M50 29th ; Tom McCulloch 167th(51:56) M50 38th. There was further success for Seaforth as the Seaforth u13 boys team of Scott Sprang, Declan McGhee and Daniel Martin took the team bronze with the u17 womens team of Kirstin Oakley, Lisa Rennie and Rachael King taking team silver. 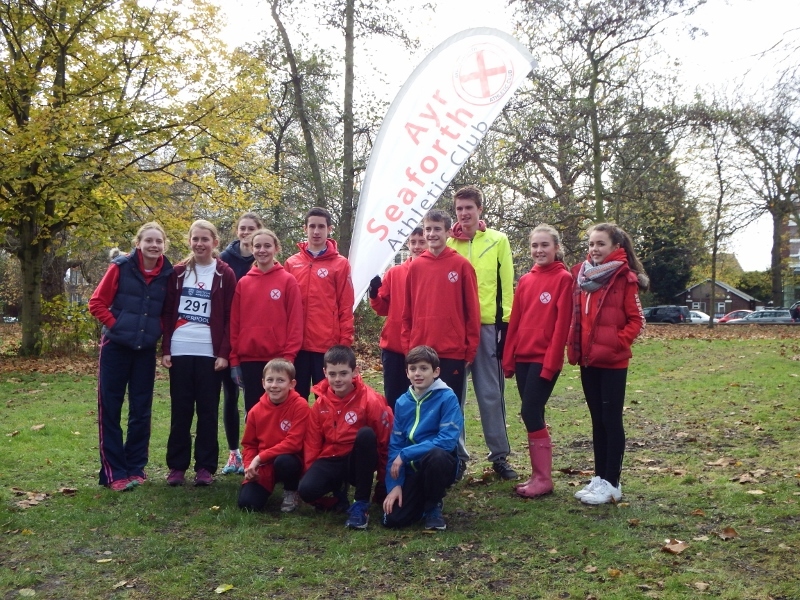 A team of 13 athletes from Ayr Seaforth competed today in the British Athletics UK Cross Challenge which took place at Sefton Park, Liverpool. 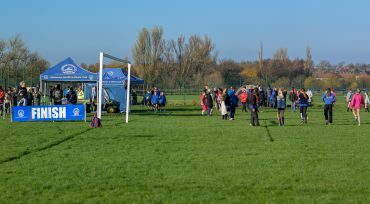 The athletes and parents travelled down the day before and stayed overnight in nearby Widnes in preparation for the race. After a freezing cold night frosty conditions gave way to a fine day with temperatures rising and the course in turn softening up. The first race of the day was the u11 race which saw both boys and girls run together. The sole Seaforth competitor in this category was young Lewis Martin who came 52nd out of 72 runners over the 1.9km course in a time of 8:43. Next up was the u13 girls race which was over a distance of 3km. Seaforth had 3 athletes competing in a starting line up 107 runners. 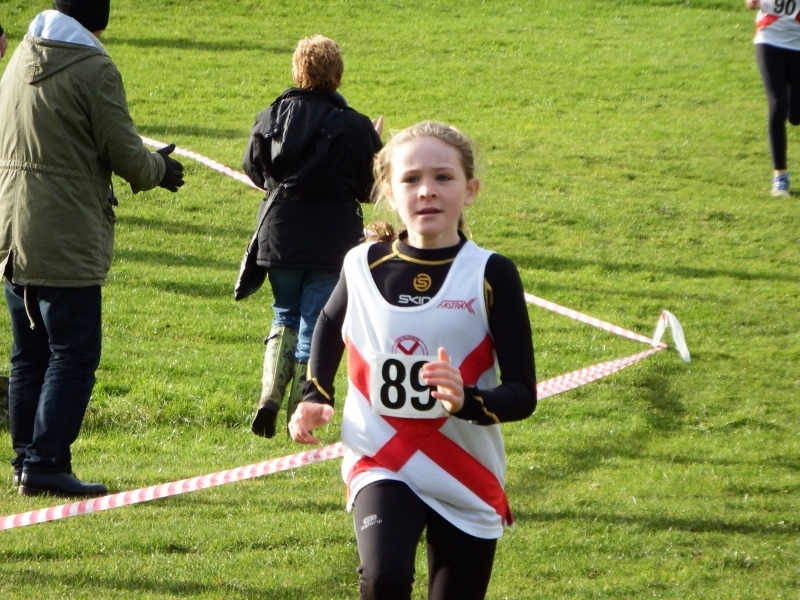 The run of the day saw u13 starlet Emma Frew complete the course in a time of 11:29 coming home in 7th place. Emma was followed by team mates Caitlin Chilton 69th (13:17) and Jena Anderson 84th (13:57). This was followed by the u13 boys race which had 114 runners over the same distance with 4 athletes competing for Seaforth. First in was Scott Sprang in 20th place in a time of 11:09 followed by Daniel Martin 31st (11:22), Greig Oakley 58th (11:54) and Steven Martin 77th (12:31). The u15 boys race followed which was also over a distance of 3km. In this race Seaforth had a sole runner in the field of 135 starters. Fraser Stirling completed the course in a time of 10:11 coming home in an excellent 25th place with only 11secs separating him and 14th place. The u15 girls were next over the distance with 2 Seaforth athletes running in the field of 87 runners. Finishing positions for this race were Mia Cullis 78th (13:50) and Rebecca Martin 83rd (14:30). The penultimate race of the day with a Seaforth entrant was the u17 womens race which was over a distance of 4.4km and was run alongside the u20 womens race with a total of 85 entrants in the u17 category. The sole Seaforth runner was Kirstin Oakley who completed the course in 21st place in a time of 16:20. This again was a close race with no less than 8secs separating 13th to 21st places. The last race with a Seaforth athlete was the u17 men which was run over a distance of 5.5km. A total of 110 athletes completed the course with James Pettigrew coming home in 48th place with a time of 19:11. With the exception of Kirstin and Greig Oakley all other athletes were making their debut on the British stage and will have gained invaluable experience of competing at a higher level than is usually found north of the border. No doubt it will stand them in good stead for future races and many will compete in the British Challenge series next season. Saturday 16 November saw those athletes who entered this years Ayrshire Cross Country Championships greeted by a cold, windy but dry day with the wind having more of a bearing on the older age groups who had to run into the teeth of the wind when heading out to the farthest part of the course. The first race of the day was the u11 age group where Seaforth had 7 girls and 5 boys running over the 1200m course. In the girls race Seaforth completed a clean sweep of the medals with Rosie Davidson 1st (3:49), Evie Mackay 2nd (3:53) and Scarlett Ross 3rd (3:54). They were followed by Alex Meldrum 5th (4:00), Nadine Sturgeon 7th (4:09), Morgan Brown 8th (4:11) and Molly Weatherston 12th (4:22). The first 3 girls also claimed the team gold medal. In the boys race Seaforth again were amongst the medals with Ruben Lindsay 2nd (3:48), Max McLean 3rd (3rd (3:49), Lewis Lennox 4th (3:52), Mason Alexander 6th (3:56) and Lewis Martin 7th (3:57). The first 3 boys home also claimed the team gold medal. In the u13 age group which was over 3000m Seaforth were again heavily represented with no less than 8 girls and 6 boys. The girls was won by Emma Frew (11:20) who was followed by Lucy Davidson 2nd (12:24), Caitlin Chilton 3rd (12:34), Charlotte McDowall 5th (12:54), Jena Anderson 6th (13:00), Alexandra Smiley 8th (13:07), Emma Low 9th (13:09) and Melissa Miller 11th (13:30). The first 3 girls won the team gold. In the boys race Daniel Martin won in (11:03) with Greig Oakley 2nd (11:37), Steven Martin 3rd (11:56), Blair Smillie 5th (12:45) and Ben Smyth 7th (14:33). The first 3 boys were team gold medalists. Scott Sprang had to pull out while leading owing to injury which thankfully turned out not to be serious. The u15 races had 3 girls racing over the 3000m course with 4 boys running the 4200m course. In the girls race India Birrell ran an excellent race to come home in 2nd place in a time of (12:33) followed by team mates Mia Cullis 4th (13:27) and Rebecca Martin 5th (13:37) to take the team silver medal. The u15 boys saw Fraser Stirling continue his fine form with a 1st place finish in (13:36), Lewis Ross 2nd (14:13), Callum Meldrum 5th (15:25) and Ewan McLevy 6th (15:34). The first 3 boys took the team gold. 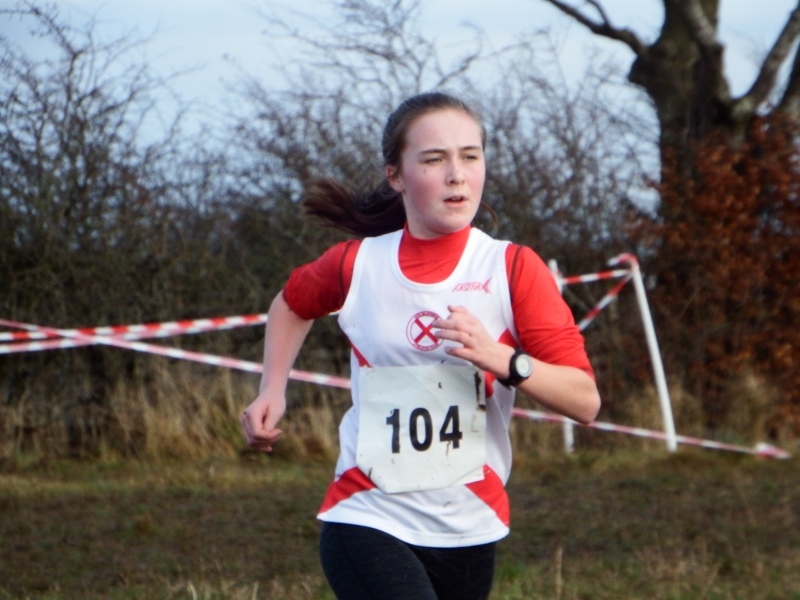 The u17 races saw Kirstin Oakley record a convincing win over the 4200m course in a time of 14:35 followed home by team mate Lisa Rennie in 16:22. The boys race which was over a tough 6000m was won by James Pettigrew in 20:39 with Matthew Brawley 2nd in 21:57. With the senior women and senior mens races starting together Seaforth were again very well represented with Gael Riddle the sole female entrant continuing her first season of cross country with a fine 4th place finish over the 6000m course in a time of 26:58 which also had her the first F35 runner in. The senior men had 12 runners for the 9000m course which reinforced the recent large turnouts for the section, the ever increasing number of athletes competing for the senior section has not gone unnoticed by other clubs and is becoming a regular topic of conversation. The first competitor in was Kenny Neil 5th (32:31) followed by Stephen McCrorie 10th (33:23), Alex Dunlop 13th (34:30), Steven Eaglesham 15th (34:46), James Murray 16th (34:58), Craig Brown 17th (34:59), Chris Boyce 21st (35:57), Stuart McLean 24th (37:00), Laurence Baker 26th (37:23), Paul Turnbull 29th (38:24), Ian Young 33rd (39:24) and Tom McCulloch 37th (41:15). The first 6 Seaforth runners also claimed the team silver medal. The next event on the cross country calendar is the McCain Cross Challenge in Liverpool next Saturday where Seaforth have a team entered.